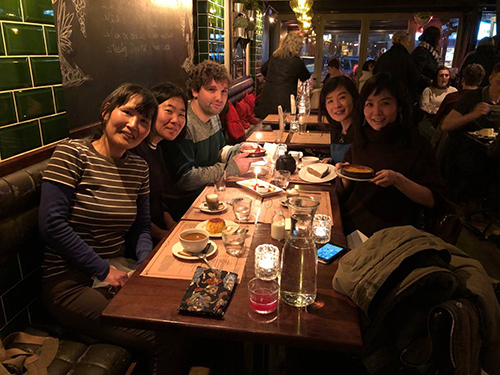 On Sunday evening on the 3rd of March five of us gathered to say farewell to Ms. Shoko Oyagi(Faculty of Humanites History 2003) in a Spanish restaurant in the southern part of the heart of Dublin where we had scattered snow, first time for a good while. While we nicely shared various Tapas dishes, we all continuously talked about our recent days and our memories. Ms. Oyagi has been living in Ireland since 2010 and she is about to go back to Japan. We all felt it was very sad to say good bye, but wished her a bright future with happiness. When we left the restaurant, the snow had already stopped after a few hours falling. We hugged each other hoping for a future reunion.